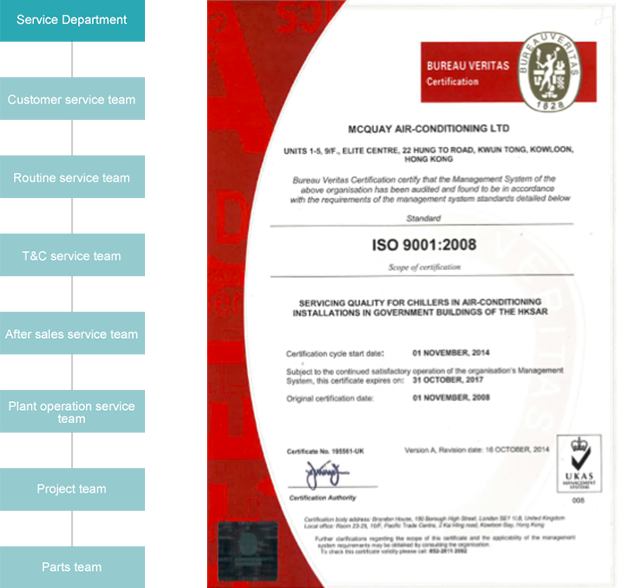 McQuay Service Hong Kong, ISO 9001 Certified, has plenty of professional service technical persons – we own registered professional engineer RPE, registered electrical workers with REW A, B C & H licenses who comply with local rules and laws, they are trained under long-term and systematized training plan from various factories and rich resources support from equipment manufacturers. The strong service teams and advanced service equipment could ensure the swift and high level quality services. We own the most powerful testing equipment & tools with the highest technology in the field. We make sure that associated with the tools to provide the most efficient economic and fastest way to solve the problems and services effectively. Not only all product service training courses as per product lines are organized by every factory in Shenzhen, Wuhan, Suzhou and worldwide, which will ensure all service staff to own technical service skill, updated technical information universally. Examinations are always conducted to upkeep their service standard. But also, to provide environmental friendly senses and safety concern to technical staff while servicing equipment. Periodically, we assign third parties to conduct safety and environmental assessment in job site to make sure our staff working method and overall reviews.